This entry was posted on May 6th, 2014 by IPSL. Unless you only have one supplier available to you, it can be difficult to decide which company is likely to offer you the best service. Cost will be a major consideration, naturally, but picking the cheapest option is not always the best decision—you could end up with a sub-standard product or service. You could also go with a personal recommendation. This is not a bad line to take as you are more likely to enjoy good service. But if you are still undecided, checking out what accreditations the company has is one way of weeding out the wheat from the chaff. Thankfully, IPSL has several key accreditations to their name, so you are always assured of an excellent service from start to finish. In order to achieve a prestigious CHAS accreditation, suppliers have to have a health and safety policy statement. They also have to show that their health and safety arrangements are up to an acceptable standard. We are pleased to be part of the CHAS scheme as this helps us win work with clients in the public and private sector. Buyers can access the CHAS database to check whether we have the ability, experience and necessary resources to carry out the work. This gives them peace of mind that we can manage a site effectively and safely. 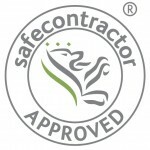 The safecontractor scheme is another prestigious health and safety accreditation scheme. In the same way as the CHAS accreditation does, safecontractor provides specially tailored, standardised health and safety assessments for a wide range of different businesses. There are over 210 big names associated with the safecontractor scheme, including General Motors UK and Kelloggs, plus more than 20,000 smaller contractors. Many large organisations in the UK use safecontractor to find reputable suppliers, so membership of the scheme helps us secure new business. ISO 9001 accreditation allows businesses like us to demonstrate the quality of our processes, increase productivity, reduce costs, achieve greater levels of customer satisfaction, and be more competitive in the marketplace. In order to achieve ISO 9001 we have to have robust management techniques and processes in place. This helps us to streamline our processes and reduces errors, which makes us far more efficient when dealing with clients. Streamlining processes also helps us to save our clients money, which is always a good thing in the current economic climate. One thing you can be sure of when you deal with IPSL is that we take our business seriously. The fact that we have acquired various industry accreditation ratings means we are committed to providing excellent customer service. We want our customers to be happy and we know that streamlining our business processes and ensuring that stringent health and safety policies are in place is definitely the way forward. Membership of schemes such as safecontractor and CHAS is a sign that you are dealing with a competent contractor, which is important when the job is time critical and the budget is tight.